Wow! Here is yet another great nappy cover from Bummis! The brand new SUPER BRITE was designed to ensure a perfect fit – even for those long, skinny babies that need a little extra protection around the leg. This gusseted cover closes all the gaps! You will find the fit of this nappy cover like no other – the gusset with lycra binding is an innovative design that wraps softly around baby’s leg with a lot less bulk than normal gussets. The result is a very trim and beautiful cover. And no elastic to leave marks on baby’s tender skin - only soft form-fitting lycra. The SUPER BRITE is lightweight and waterproof. It consists of one single layer of polyester with a wipe-clean laminated interior. Not only is this cover made from a fabric of amazing quality, but you can be 100% certain that it adheres as well to stringent environmental and toxicity standards. Cut and sewn in the Bummis own factory in Montreal to be assured of good quality and fair labour practices. 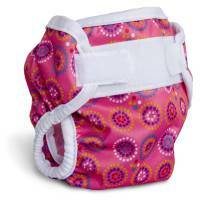 The SUPER BRITE is designed to function well with any type of nappy - flat or fitted. Love these covers, wouldn't buy anything else. Never had a leak. I love these covers on my daughter (almost 5 months). They are such gorgeous colours and we are yet to have a leak. The gussets are particularly good at containing messes and creating a snug fit around the legs. Click the button below to add the Bummis Super Brite Wrap to your wish list.